SANA’A, YEMEN — “My mom said we don’t have enough money to buy new clothes this Eid because of the war,” proclaims Nassem, a young Yemeni girl. Instead, her hands are adorned with hena’a — a black liquid applied to form intricate designs to the skin. “I want dad to see my hands, he’ll like it, Nassem says. But Nassem’s father likely won’t be able to oblige his daughter’s wishes anytime soon. Instead, he is on the battlefield in Hodeidah defending against the U.S.-backed Saudi coalition, which is waging a brutal assault on the port city. Volunteers have descended on Hodeidah from all over Yemen to assist residents and repel the U.S.-Saudi-led attack. The annual feast of Eid al-Fitr, an important Muslim holiday marking the end of Ramadan, kicked off last Friday in Yemen. But for Nassem and other Yemenis the occasion was far more somber. For them, there was no Eid, only raids, a suffocating blockade, the threat of cholera, rubble, tears, and fear of the next airstrike. Millions of Muslims the world over celebrate Eid al-Fitr with joyous festivities. Their homes are decorated; families and friends exchange gifts, gather for feasts; children play in parks, indulge in sweets, and set off fireworks as food and gifts are distributed in abundance. Muslims in the United States and Saudi Arabia are no exception, celebrating while their counterparts in Yemen have lived in fear of U.S. and Saudi military action for six consecutive Eid holidays. Though Saudi Arabia is ostensibly a Muslim country, that factor wasn’t enough to stop the Saudi-led coalition from carrying out a barrage of airstrikes on the Muslim holiday. Seven civilians including a woman and two children were killed in Friday night airstrikes in Saada and Beni Fayed. “Warplanes hover overhead every now and then, I cannot celebrate as I see others lose their family members, houses and properties,” Hussein Shurgubi, a journalist based on Saada, told MintPress. Shurgubi has been busy monitoring hospitals and health facilities since the Saudi aggression began, killing or injuring 36,000 people since 2015. Last year, five people were killed and four injured when a Saudi airstrike targeted a house in the Serwah directorate in central Yemen, on the first day of Eid al-Fitr. Jahaf, like two million other Yemenis, faces destitution as his salary has gone unpaid for more than 20 months after the Saudi-led coalition moved the central bank from the capital of Sana’a, under Houthi control, to the southern port city of Aden. Even in the Saudi-controlled port city of Aden, Yemenis struggle to survive, living under the constant threat of daily attacks targeting civilians and the military. Al-Qaeda and ISIS move freely in the area, carrying out reprisals against civilians. At least 25 clerics, preachers, and religious scholars have been gunned down since 2016 in Aden alone. Yemenis are proud of their culture and many mark the Eid al-Fitr holiday with visits to one of the numerous historic sites that dot the ancient landscape. “It brings a smile to your heart visiting the places of history on Eid, despite the destruction,” Saleh told MintPress, guffawing with a raised eyebrow like a man who’d lost his mind but was trying his best to enjoy himself. He was en route to the historic city of Kukaban, a small fortified city built 2,800 meters (9,200 feet) above sea-level atop a mountain in the southwest city of Sana’a. Kukaban is registered as a World Heritage site, one of the many destroyed by the Saudi-led coalition in 2016. Most of Yemen’s once-booming tourist sites have been targeted by the U.S.-Saudi-led coalition. Hotels, resorts, cafes, gardens, parks and event halls have all been destroyed by coalition bombs, leaving up to 95 percent of hospitality workers without jobs. Indeed, tourism and related sectors have suffered losses of more than $6 billion, owing to the destruction of more than 85 archeological monuments and 223 tourist facilities, according to a report issued by the Tourism Promotion Board. Even if tourists were brave enough to venture into Yemen amid the Saudi-led onslaught, a coalition-imposed land, sea and air blockade has led to the suspension of all flights to Yemen, and most airports and seaports have been destroyed. With traditional venues rendered inaccessible, Yemenis have found a new way to mark Eid al-Fitr. Saleem is just four-years-old, but as he stands atop his father`s grave amid a meadow of martyrs’ shrines, he knows who sleeps in the soil beneath him. His widowed mother, Salma, packed homemade sweets and nuts to gift to visitors of the memorial site. “This is the park that we now visit on Eid; we come every morning here, it’s our fourth time this Eid,” she told MintPress. Visits to the memorial by the families of those killed in the war have become a new Eid tradition. This particular memorial sits in Jeraf city, in the middle of Sana`a, and is the resting place for more than 70 men, women, and children killed by Saudi airstrikes along with the countless bodies of fighters killed in the war. The shrines sit, ensconced with ornamental flowers and small trees planted by visitors who have come to honor the deceased. 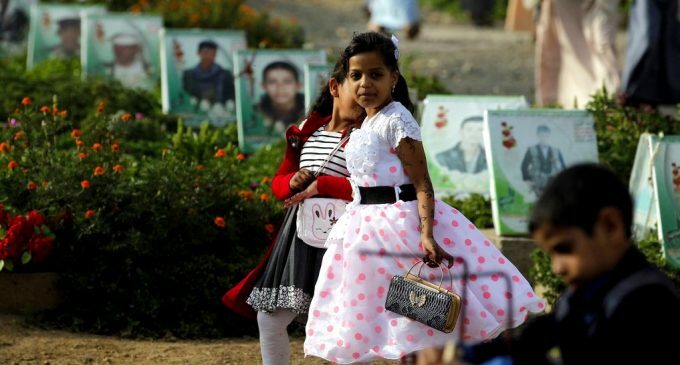 In Yemen, the size of the cemeteries has increased dramatically over the past three years, with dozens of new burial sites springing up to house victims of the war, as well as of the hunger, malnutrition, and disease that have accompanied it. The post As Families the World Over Celebrated Eid Al-Fitr, Yemenis Marked the Holiday by Mourning Their War Dead appeared first on MintPress News.